Today I would like to share our family room with you - this isn't a fall tour it's just where we are now. These pictures might help you see that the kitchen, family room, and dining room/entry are one big open space. The areas are separated subtly by moldings and architectural details. The rugs and lighting also help separate the areas. Those of you who have read Poofing the Pillows very long know that for many years we've had a color scheme dominated by the color red. I loved it with all of my heart and soul but it was time for a change. Have you ever wanted to change your color scheme but looked around and thought it would be terribly expensive to do so? That's what I thought! (These are affiliate links that will take you directly to the items. With time and careful consideration I realized that the item locking us into the color scheme we had before was the Karastan rug we purchased many years ago. It was expensive by our standards and letting it go was hard. Almost all of our other furniture pieces were rather neutral and I realized that changing the rug would allow me to move away from the reds. We were able to pass the rug and some other pieces that didn't work in this house to family members. That was a win and took away the guilt feelings. Can you relate? The colors I would like to have in this house include gray, aqua, soft green, and soft pinks. The Sherwin Williams Watery island and front door are so much fun and I'm proud for stepping out in that direction. The walls are painted Sherwin Williams Eider White which is white with just a smidge of gray. We have purchased a new rug and coffee table. The rug is from Birch Lane (affiliate link) and I have to say that for the price it is definitely a winner! The coffee table we had before was too small for this space and looked silly. I found this one at Ballard Designs and we love it! The fireplace and built-ins still need work. In fact, the builder still needs to come back and do some touch ups on that wall. I do love having built-ins on both sides of the fireplace because the symmetry makes me happy. 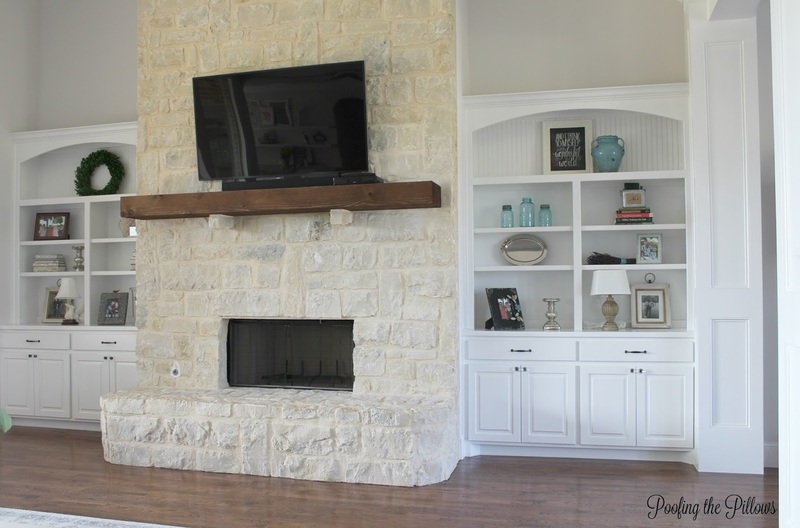 Having the tv over the mantel would never be my first choice but that works best for the layout of this room and it makes my hubby happy which are both important considerations. You live and learn as times goes by and we chose very carefully for this house based on things we know about our family. Our last house had three living areas and we never used two of them. This house has one living area where we can all be together. 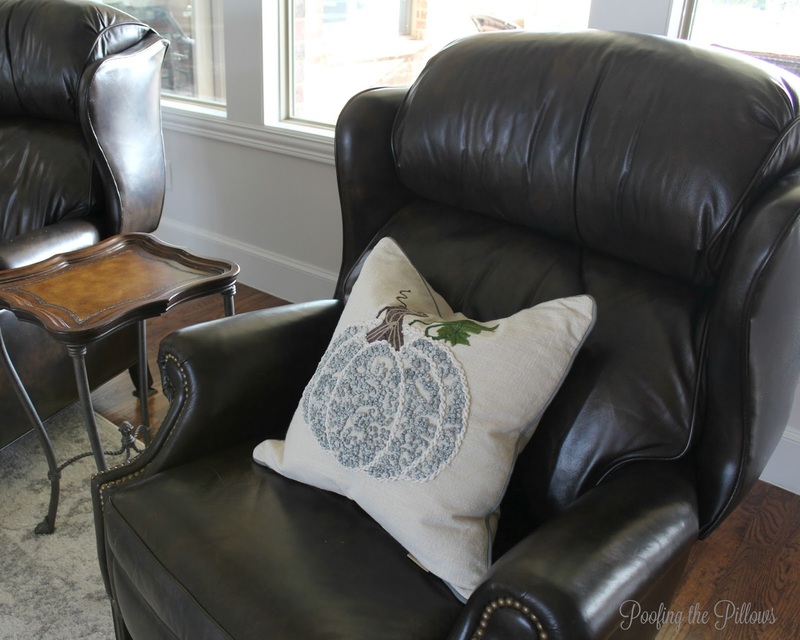 We still need one or two more chairs and I'm considering these or possibly these swivel chairs that Rhoda at Southern Hospitality loves. The new color scheme is peaceful and feels restful. The color changes have been made mostly through accessories. We did downsize so we had most of what you see with the exception of the pillows. Pillows are the best!! We sold many things through Craig's List or Facebook. So here we are now at almost 3 months in our Forever Home. We are so happy here. We still look around and pinch ourselves. I still see all that is incomplete but that's ok because the process is too much fun to rush through. Have you considered changing your color scheme? I dare you to carefully consider what might be holding you back. I hear people say they would like to change all the time but think it can't be done. We realized that it wasn't that hard. I totally changed my colors from reds and greens to neutrals and pops of aqua, blues and greens. You are right it is calming and totally fits the new Florida space. Your color choices are beautiful! I like your new, calming space, Stacey, and the rug is very nice. I've had both kinds of chairs you're looking at. As for the bergere, they tend to be deep-seated, so it's a little easier to curl up your legs into (or a guy to have plenty of depth for long legs). The swivels are a little more petite, but they also worked for both my husband (long legs) and me. Both are winners. 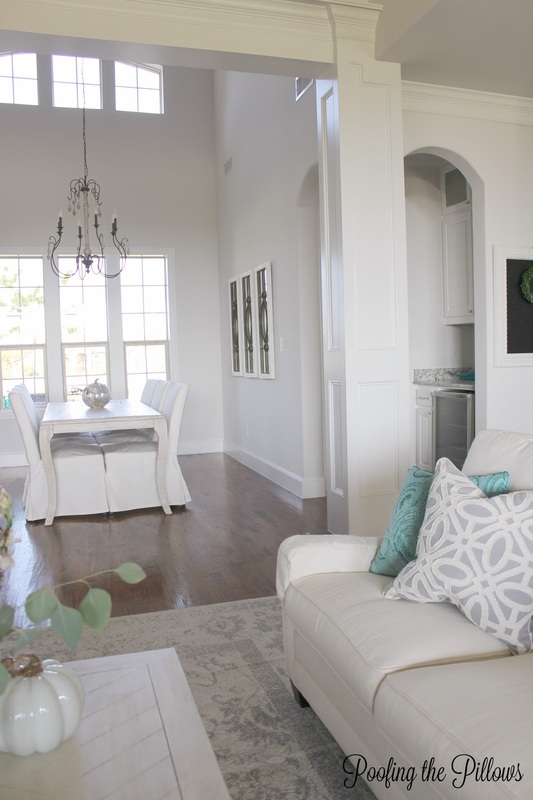 Stacey, your living space is beautiful, I love the color palette that you have chosen...calling and serene! 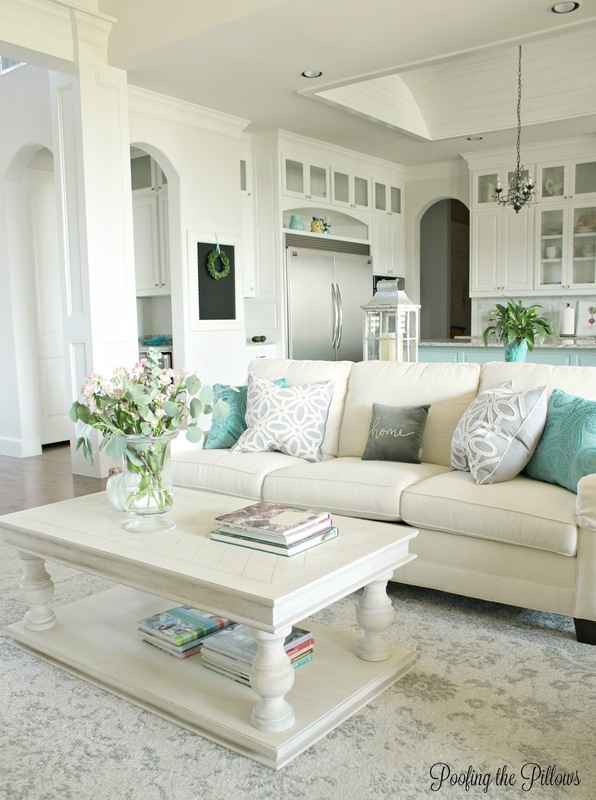 Your family room color scheme is so soft and pretty. Love your new coffee table and rug. I still love my reds and yellows, so that is the direction we are going with our new house. It is just lovely. So fresh. I made a rug change a year ago. I struggled with parting with the old based on what I had paid for it. The moment I took it out of the room, I was happier. Sometimes we just need a change. Your home is gorgeous. Enjoy! Stacey, it truly is a lovely space that feels very fresh. I love your living area and all the soft colors. We have the exact same dilemma in my house with changing colors. We have somewhat of an open floor plan and I have a lot of red as well. The dining room has red walls and some red in the rug and the living room has a wool rug which has red in it too. I haven't been able to justify getting rid of the rugs for what I spent on the living room one so I am feeling kind of stuck. I am going to start by painting the dining room and possibly replacing that rug. It's going to be a slow process and will take lots of time convincing my husband. You have inspired me though! Oh sweet lady, I need help with a color scheme! I just can't decide for our family room kitchen area. Our cabinets are the same color as yours and I am leaning towards some blues! Your space just makes me jump for joy! Gorgeous! It is hard changing colors but you have done a beautiful job of it! It is all so clean, pretty and inviting. Now that my husband hinted that we might just stay here forever (he wanted to downsize), I have started my list of things to do, including color! Your new home is just beautiful. I love all of the molding and built ins. So pretty! Changing colors in your home is so hard!!! ( At least it is for me. I'm slowly but surely getting there, I think. ) You've done an amazing job changing things up! It is gorgeous Stacey! Turquoise is my very favorite color and it works with so many things and seasons. A neutral base is so smart, you can easily change things out with pillows and accents, and bring your favorite red back for Christmas! Stacey, this is just beautiful! I love your new color scheme, and that fireplace is gorgeous! Happy Monday!!! 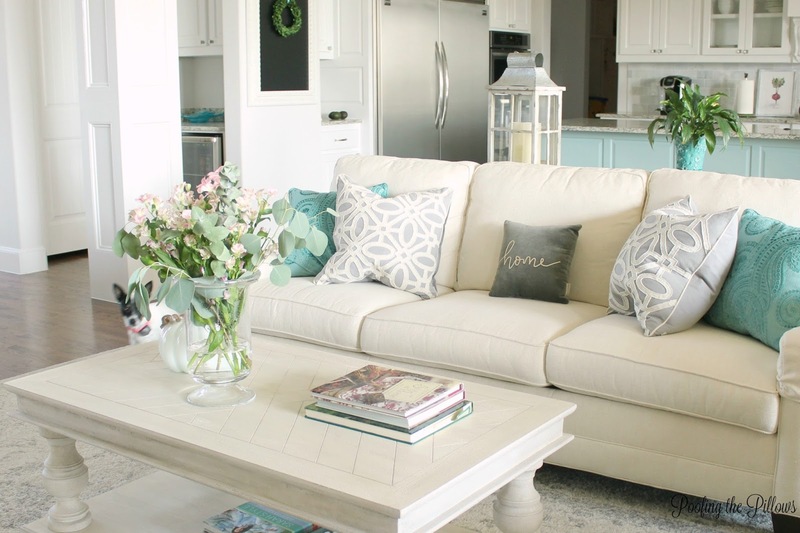 Love your new home and the soft colors are so perfect. Such fabulous architecture in your new place too. Oh Stacey I am just swooning. I bet you have the biggest smile on your face everytime you walk into these rooms. They are so soft and pretty and welcoming. I love that chandelier in your dining area. Did you ever share where you got that? I love the rug too. I will check out Birch Lane. I have been searching for one that is light and has a touch of gray in it. So pretty. Happy New Week. Absolutely gorgeous, Stacey! It looks fresh and bright. I love the color change. It suits the house well. Several years ago, I wanted to ditch my red plaid couches for white ones, but the red ones were in perfect condition. We bit the bullet, bought new and gave the old ones to my niece and her husband to fill their new home. They now have two babies and two dogs and constantly send me pics of everyone cuddled up on my old sofas. What could be better than that? I love your neutrals! I was going to change the color scheme of my home but when I inherited a new sofa that is denim well that plan went out the window. Might be OK while my Grands are so young anyway. Just gorgeous. Fresh and restful!! I'm so happy for you and I love your new color scheme. It will be easy to change in the future as well. 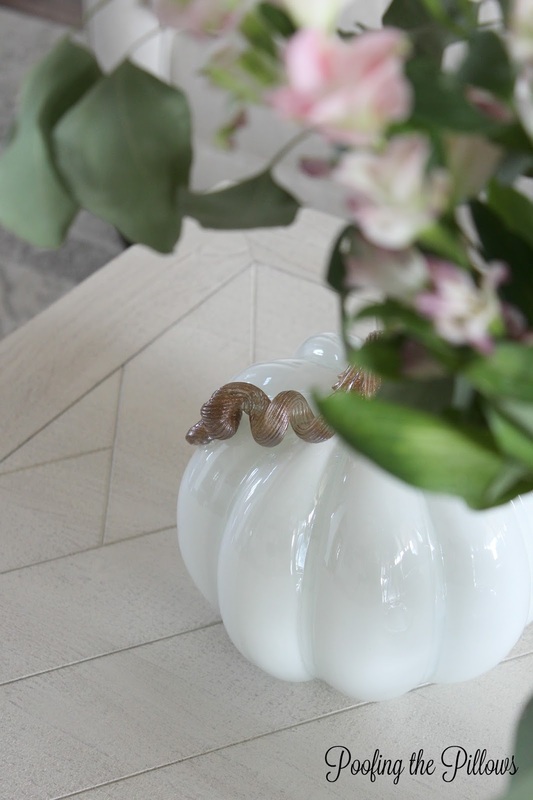 The pumpkin pillow in your new color scheme is adorable. It is beautiful Ms. Stacey and fits my perception of you!! I miss the reds, and envy the person who inherited your rug!! You two are moving forward...FAST!!! It would take me a year to get everything so "together". Stacey... I positively LOVE your color scheme. It is so fresh and clean looking. It is the epitome of casual elegance. Do I remember correctly that you mentioned during the building process that you live next to another blogger? Beautiful new color Stacey! I laughed when I read that symmetry makes you happy. Totally get that girl. Something about it is soothing. Love it all! I love what you have done. We had browns in our living room and I am getting out of that. We painted the walls and I am gradually getting light colors in. It will take awhile to get more color in,but I am determine. I love the coffee table. I plan on buying new tables soon. Love, love your new home! And I think you have picked the perfect colors to decorate it. Gorgeous! I love everything about your new home Stacey...the ceilings, the kitchen cabinets, the flooring, the colors...it's all so lovely and I'm so glad you're my Guinea pig ;) I've definitely been thinking of the same colors so it's fun to see them in action. Unlike you though, were starting completely from scratch. All we brought with us was a rocking chair (sentimental reasons) and two cabinets for indoors and two outdoor tables. We will be making a trip to highpoint and hickory! Everything just looks so beautiful, Stacey! You must feel like you're in such a bright, light space. 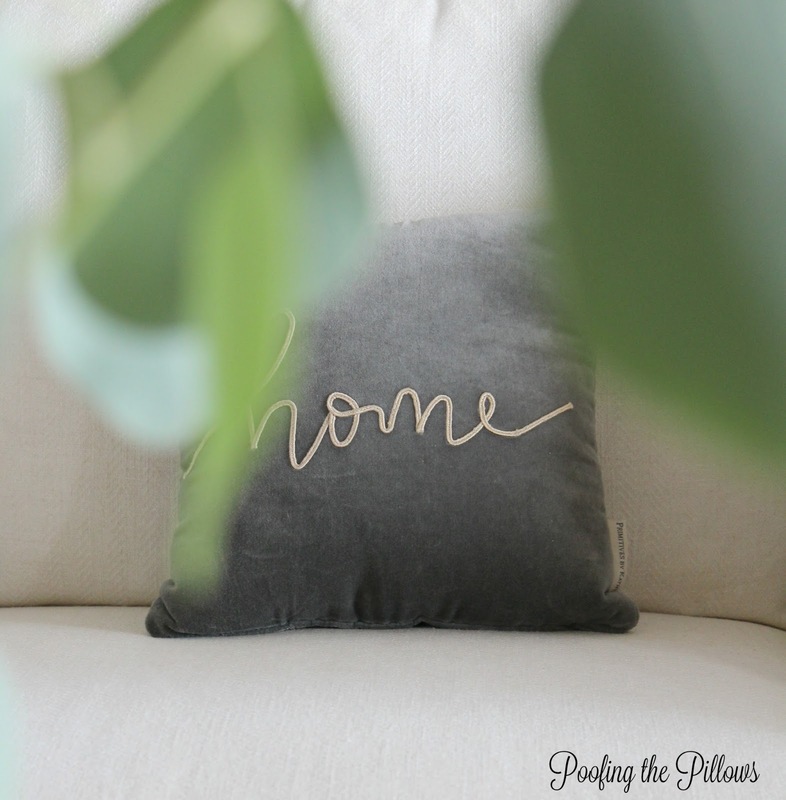 Your pillows are perfect and can easily change with your mood or season. I love it all!! Thank you for sharing. Oh Stacey, It's beautiful! I love the colors and all the spaces just flow so beautifully. Mine is a slower process but I have been getting rid of the red that I loved so much and replacing it with neutrals that I can add colorful accessories to. It's so much easier to change up looks that way. I certainly feel that we go through color stages, don't you? I'm kind of loving black, white and green at the moment. You are going to have so much fun putting fresh colors and décor in your new home :) I can't wait to see more. Stacey, this room is gorgeous! You know me, I love all that mill work, columns, moldings, built-ins, wow! Now, yes, the calm palette is beautiful and you can easily change it at any given time. That rug and coffee table are awesome! It all looks so beautiful, Stacey. You are doing a wonderful job and you are smart to take your time and buy what you love. Your color scheme is dreamy and they are colors that are easy to live with and give you a lot of flexibility to make changes here and there. I love it all!!! Beautiful job!!! Stacey your new home is just beautiful! I love the turquoise and white, and the neutral look you are doing. I do have to say though a few splashes of red from time to time might look quite well during certain seasons. I know it's been a long journey so enjoy your new home, you deserve it! I love white...with a little gray. That's my favorite color to wear now too. And you can add color any time as long as you have neutrals as your background. I have 2 red sofas in my living room but it's still a light and bright room with all the natural light. I love your new home. I know you are enjoying it! Hugs! I love your updated color scheme! I really love your kitchen island! It's so pretty, and it helps ground your room with all the white and barrel ceiling (which I love). Our kitchen island has been four colors, but it has been pink for at least four or five years, and I love it! But if I ever change it, I'd go with a shade similar to yours or lime green. Love everything you've chosen for your new home. It is so light and happy. Enjoy!!! Your home is just lovely...and welcoming...and serene. Absolutely gorgeous, Stacey...I'm in love with the color scheme. Well done. I'm going to look up that area rug--it's spectacular! Stacey, so lovely, so fresh, and calming. I am so happy for you. Enjoy your home!! So beautiful, Stacey. It feels like spring every day! I love the aqua. It's one of my favorite colors. Knowing me, white (which I love) isn't a color I could live with full time -- partly because it cools me off, which is great in the summer and would make me crazy in the winter, and then there's the mostly-black cat who has bad manners! But I love it in other peoples' spaces -- so restful and calm. I'm thrilled that YOU are thrilled with your home. You should be. You've worked hard to have just what's right for you making tough decisions and it paid off big time. Absolutely splendid. Beautiful calming colors that are a great choice Stacey. Love all that space. I think my whole apartment would fit in your living room. Enjoy your forever home. Your room is so lovely. I love aqua and find your room restful and happy. Love all the light. All the architectural elements make it so elegant. Form definitely follow function so you are wise to seek comfort in chairs and function. The older you get comfort is so important. I admire you taking the plunge with the rug. I should do the same. Having a wonderful time catching up with your posts today! I really understand what you mean about making a drastic color change, I started over a year ago, and I'm still adapting! To me it looks as though you have done so much in just a few short months. There's nothing wrong with taking time to carefully consider how we spend our decor $$$. Honestly, the architectural details in your home are so gorgeous, you could never do another thing and it would still be perfection ;) I'm looking forward to seeing what you decided about your dining room draperies, though! xoxo! Absolutely gorgeous, Stacey! I love the soft hues you've chosen, they seem so peaceful and calm in this crazy world. Oh, everything looks so pretty! Everything looks so beautiful Stacey! I love your colors. So bright and airy. We did the same thing with our new home. One living area and one dining area. I love it! No wasted space! I so love it! I am so happy for you that you are in your Forever home and happy with the results of the house and your interiors that best suits your needs as you go forward. Yes, so hard to let go of things, especially those of which you had formerly treasured and saved for. Glad that you were able to pass down the items to family members...yes, that always makes it feel better. I cannot wait to get to the point of where you are now! Happy Fall Stacey! absolutely stunning! I love all the white! Yes, I can relate about passing something on so I can get something new. I do that all the time, especially with clothes. Your home is beyond stunning - and your color palette is so tranquil. I just love it, Stacey and couldn't be happier for you.